NASA posted on Flickr a new image of earth, using data from NASA’s Earth-observing satellite, Suomi NPP. It is focused on North America and has amazing detail. You can view it at at their Flickr page at 8000 x 8000 Pixels, which is almost 18 MB in size when downloaded. 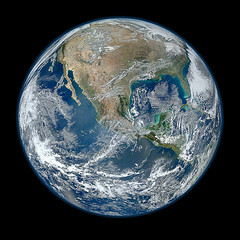 It is a composite image that used multiple passes of the Earth’s surface taken on January 4, 2012. ‹ And the nominees are . . .